Fluoroscopy is an imaging technique that involves the generation of the real time images of the internal organs with the help of the X-rays. The fluoroscopy technique enables the physician to view the internal structure and function of the patient on a digital monitor. It is widely used for the imaging of the gastrointestinal tract in order to diagnose ulcers, tumors, inflammation etc. It is also used for various surgeries. Fluoroscopy instruments are used with c-arms which enables the view of the image from different angles. Fluoroscopy is performed for the evaluation of the definite areas of the body including bones, muscles and joints. The global fluoroscopy market is anticipated to expand at a significant CAGR during 2018-2027. The rising prevalence of the chronic diseases coupled with growing demand for the minimally invasive surgeries is anticipated to be key factor for the growth of the global fluoroscopy market.The global fluoroscopy market can be segmented on the basis of surgery, end-use and region. On the basis of surgery, it is sub-segmented into biopsy, cardiovascular interventions, orthopedic surgeries and others. The cardiovascular interventions are anticipated to be the largest sub-segment of the surgery segment during the forecast period. The increasing prevalence of the cardiovascular diseases is anticipated to be the major factor for the increasing demand for the cardiovascular interventions surgery sub-segment during the forecast period. On the basis of end-use, it is sub-segmented into diagnostic centers, hospitals and clinics. Hospitals is anticipated to be the leading sub-segment during the forecast period. This is on the account of large pool of patients coupled with availability of the high quality healthcare infrastructure. 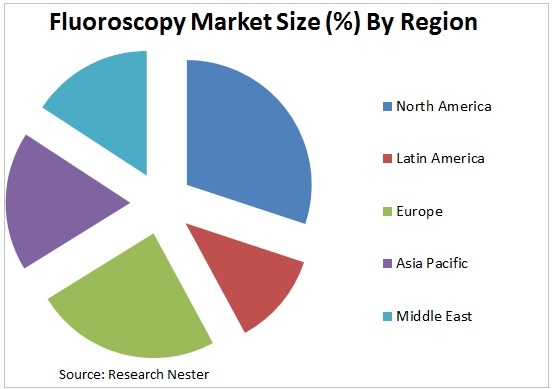 The rising demand for the minimally invasive techniques for the treatment of the diseases is anticipated to be the primary growth driver for the global fluoroscopy market. The increasing demand for the cost-efficiency, safety and rapid recovery from chronic disease is anticipated boost the demand for the fluoroscopy. The favorable government policies for proper reimbursement of the diagnosis is driving the global fluoroscopy market. The various other drivers for the global fluoroscopy market are high image quality and dose reduction. The increasing number of hospitals and physician across the globe is anticipated to boost the growth of the global fluoroscopy market during the forecast period. The increasing investment in the research and development by various companies operating in the fluoroscopy market is estimated to further propel the market growth of the fluoroscopy throughout the forecast period. Additionally, the favorable healthcare policies is also expected to fuel the growth of the fluoroscopy market. However, risk associated with the radiation is anticipated to restrain the growth of the global fluoroscopy market during forecast period.